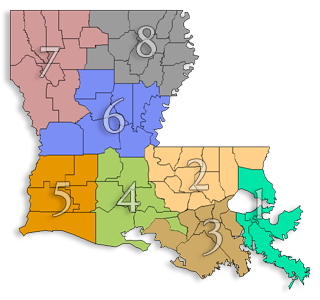 LaPDD is a state association of the eight planning districts in Louisiana. A planning district is a multi-service entity with state-defined boundaries that deliver a variety of federal, state and local programs and offer services such as technical assistance and planning services to their regions. Planning districts were founded on the principle that municipalities and parishes working together can accomplish more together than individually. The districts are where collaboration and cooperation happen which, in turn, creates a cost-effective and efficient way of addressing regional and even statewide issues. The planning districts throughout Louisiana are involved in a variety of programs and projects, which include economic development, assisting governmental entities in securing grants and loans for much needed infrastructure improvements, offering workshops and technical assistance to local governments, bringing together and connecting small agencies to resources and being the champion for the region in which they represent.